It can be found not far from Wilpena – just 16 kilometres, and if you drive from Wilpena to Hawker, to get to the Arkaroo Rock you will need to turn right onto the unsealed road marked with “Arakroo Rock” sign. At the end of the road, there is a 1.5 kilometres walking track to the cave, it is recommended to allow 1-2 hours to complete it. 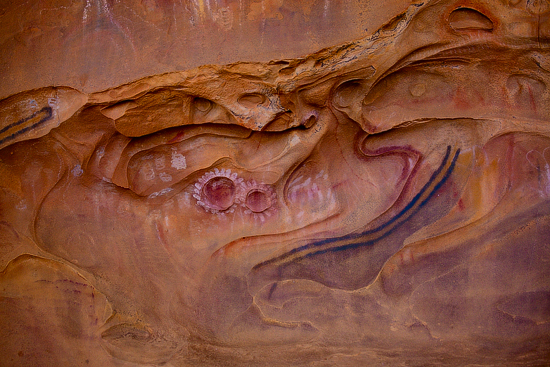 Arkaroo Rock is an important part of the aboriginal history and culture, paintings are related to the aboriginal mythology (Dreamtime) and some of them are dated 5000 years old. 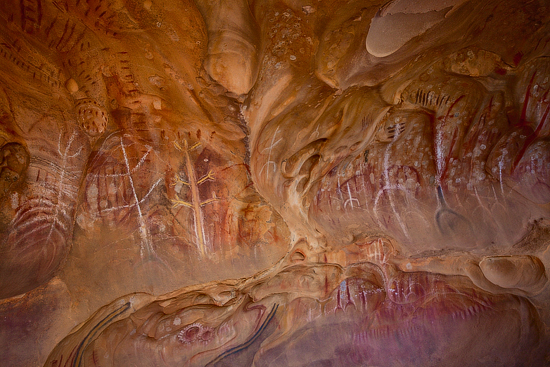 The rock which forms the ceiling of the cave is named after ancient serpents Akurra (or Arkaroo), who (apart from everything else) played an important role in the history of the Wilpena Pound. 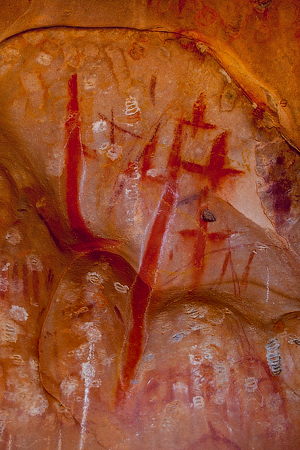 According to a legend, two Akurras surrounded a group of hunters who were preparing for an initiation ceremony. 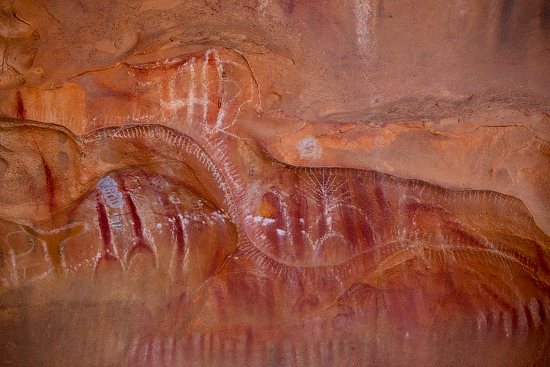 After the long and desperate battle, hunters managed to kill the snakes whose bodies petrified and formed walls of the Wilpena Pound. 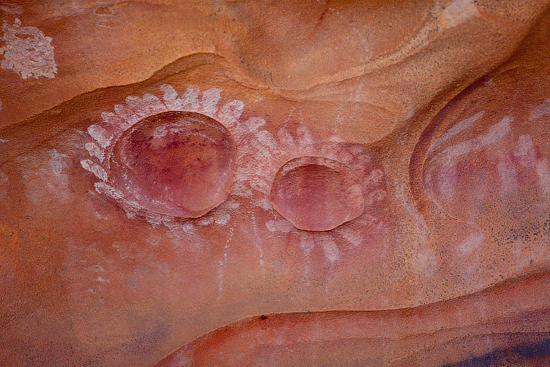 Two highest peaks in the northern part of the Wilpena Pound – St Mary’s Peak and Beatrice Hill – are heads of these serpents. 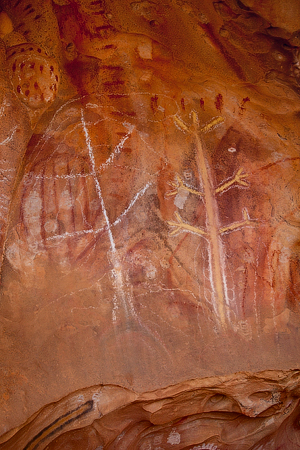 In the cave you will see many images of people, snakes, waterholes, plants and birds painted by charcoal and ochre of red, yellow and white colours, and it is believed that these images tell a story of Akurras and Wilpena Pound. 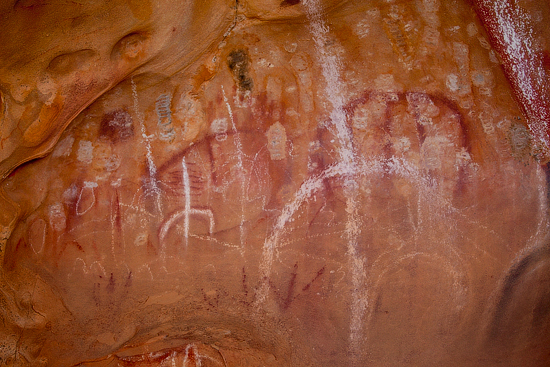 Arkaroo Rock was first visited by Europeans in 1957, quite recent comparing to its huge 5000 year history and today, to protect these magnificent paintings from us, there is a fence installed at the cave entrance.